My First Bilingual Book - Colours / Les Couleurs will help young children learn the French for different colours. 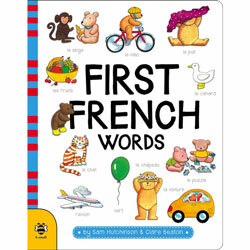 The simple text is printed in both French and English, and an easy-to-follow pronunciation guide is included. My First Bilingual Book - Colours / Les Couleurs is suitable for young children learning their very first French words. The dual-language text in this book is very simple and so parents need not have any previous knowledge of the langauge to read this book with their child. A useful parents' guide and simple-to-use pronunciation guide are included to help reading aloud. Each French word is accompanied by a phoenetic English spelling beneath it. Have bought the range in these books. Very impressed with them! My daughter loves them.